The Alleged Sub-Saharan African Origin of the Greeks? Five studies from Arnaiz-Villena claim that Greeks are genetically related more to Sub-Saharan (Ethiopian and western African) people than Mediterranean. Is there robust evidence for this theory? The Japanese appear to cluster with Sub-Saharans. The Japanese appear to cluster with Africans and Italians. The Greeks, San (Bushmen) and Japanese are grouped together. From Arnaiz-Villena et al. (2001c), figure 4. Correspondence analysis showing the Greeks, San (African Bushmen) and Japanese grouped together. Arnaiz-Villena's work has been criticized and rejected by the scientific community. 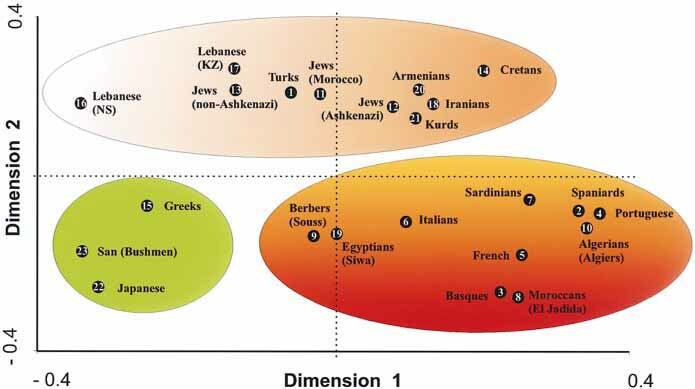 Numerous studies using proper methodology are presented, showing that Greeks cluster genetically with other Europeans. Read the full article: Genetics Studies in the Greek Population vs Pseudoscience.